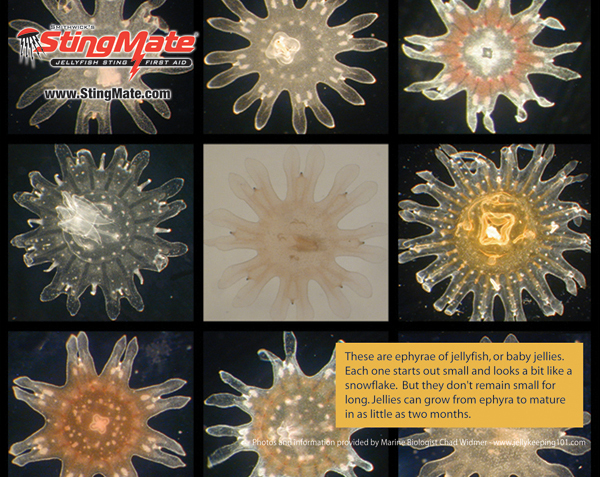 These are ephyrae of jellyfish or baby jellyfish. Each one starts out slow and looks a bit like a snowflake. But they don’t stay small for long. Jellyfish can grow from ephyrae to mature jellyfish in a bout two months. This entry was posted in 5% acetic acid/Vinegar on jelly stings, Box jellyfish, Chad Widmer, florida-jellyfish-portuguese-man-of-war-florida-beaches-long-island-beaches-hawaii-waikki-oahu-guam-austalia-stingersmauve-jellyfis-pelagia-nortiluca-black-sea-nettles-stingrays-sport-fi, jellyfish, jellyfish sting first aid, jellyfish stings, Jellyfish stings, vinegar, acetic acid, Lion's mane jellyfish, Man of War, marine sting first aids, marine stings, Pacifici coast sea nettles, Pelagia Nortiluca, sea nettles, StingMate, Vinegar on Jellyfish stings. Bookmark the permalink.